Puzzle solving mystery games are starting to appear on Facebook and Gardens of Time by Playdom is the latest installment. 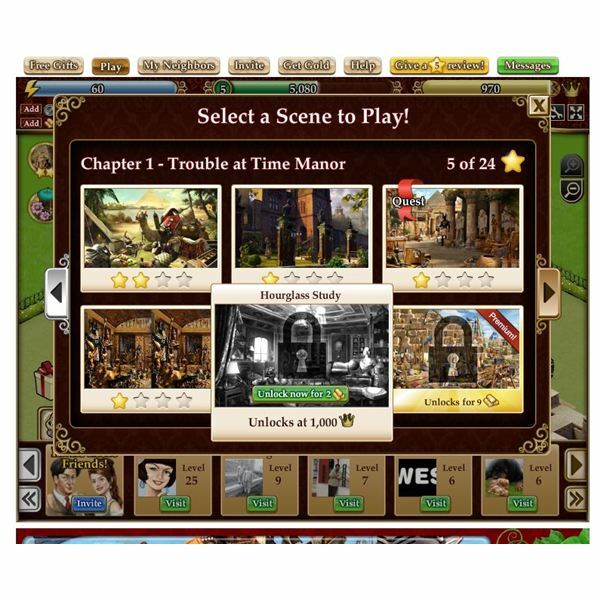 In this game, you solve a series of different scenes by finding hidden objects. The game is standard for this genre but introduces a new twist. Gardens of Time features a bit of building too with a garden area you can build up. This garden area features numerous structures and decorations and you’ll move through different ages as you decorate. For example, you’ll start in ancient Egypt, move through the Greek era and so on. The building aspect of the game is a nice break from the puzzle solving aspects of this title. The gardens structures add to your reputation points so you can level up, take part in more mystery solving puzzles, and unlock different items. The game even features wonders such as Big Ben or the Albert Hall to add to your growing garden. The puzzle-solving portion of the game gives you several different maps to explore. You can explore each map several times and master it with four stars. You’ll need to earn points to master the scene but you can move onto the next one provided you have unlocked it. You can complete many of the scenes by taking quests in the game located on the left hand side. The scenes are tied together in chapters and as you finished your scenes in one chapter, you’ll move onto the next one. You can unlock different scenes with credits or reputation points too. Currently the game has twenty-four chapters with four main scenes but since this game is new, more content should follow. There’s enough puzzle here to keep the average player entertained for ages. Puzzles can be sized to full screen, which makes them easier to see and complete. To visit different areas you’ll use temporal energy from a time machine, which are energy points like other Facebook games. Gardens of Time is a nice casual game and one of the best puzzle solving hidden object games on Facebook. The addition of some nice building aspects makes this game well worth playing. When you get tired of solving puzzles you can work on your garden, expand it, and add some great looking structures and decorations. It’s almost like tow game sin one, the first being a puzzle solver and the second a bit of a city builder game. Gardens of Time takes a bit from City of Wonder Playdom’s other great city building game. This is a game you can play as little or as much as you like since there are no crops to maintain or nothing that will expire on you. Gardens of Time looks great and loads quickly. The garden portion of the game is stunning and you can even se visitors moving around your garden. The structures are all colorful and best of all there are no slowdowns in the game. 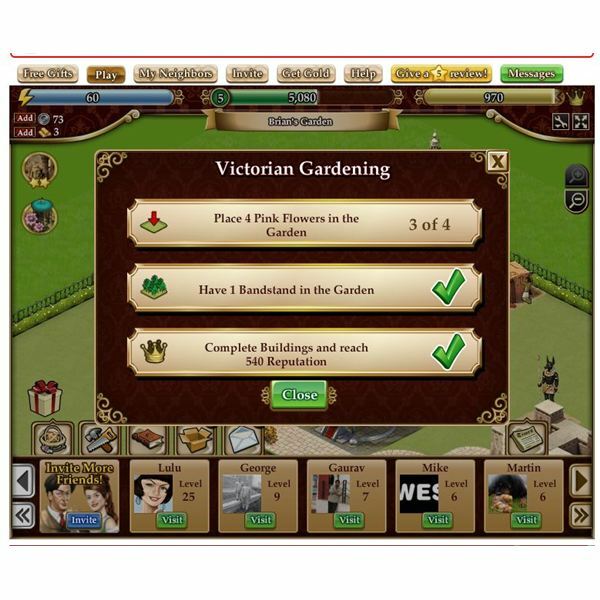 You can get a nice garden in no time as you play this great Facebook game. The soundtrack is mellow and fits the title perfectly. The sound changes as you visit the various scenes in the game too. Gardens of Time doesn’t have a great multiplayer component but you can visit the gardens of Facebook friends and earn some coins, experience, and an energy point. After you finish a scene, you can send a friend a bonus too. The game is easy to move around in and the menus are all well done. Click on the tabs in the build menu to access the various building option for your new garden. Quests in the game are found on the left hand side for easy access. Gardens of Time is a great looking puzzle solving game and it borrows some elements from Playdoms other game City of Wonder. 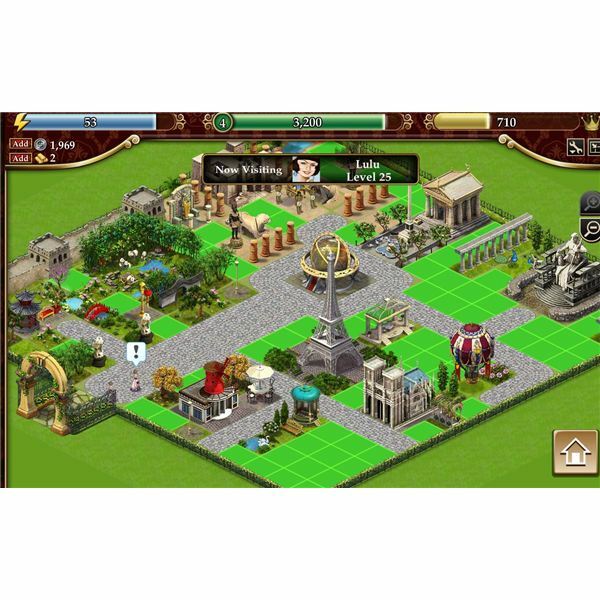 The garden building element of the game is excellent giving the player plenty of building options. The quests in the game help move gardens of Time along and the puzzle solving scenes are all done well. You can play in full-screen mode so that makes the puzzles easier to see and complete. The soundtrack fits this game perfectly and is enjoyable. If you enjoy puzzle solving games but also like to build things you'll have fun playing Gardens of Time. Playdom continues to create some great looking games and Gardens of Time is one of the best so far in the puzzle solving genre that you can play on Facebook. All images from Gardens of Time. Source: Article is author's own experiences playing Gardens of Time on Facebook.